In the 2012 American ensemble action film “The Expendables 2”, Jean Vilain (Jean-Claude Van Damme) carries a Steyr AUG A3 with an Aimpoint Micro T-1 red dot sight as his primary firearm. 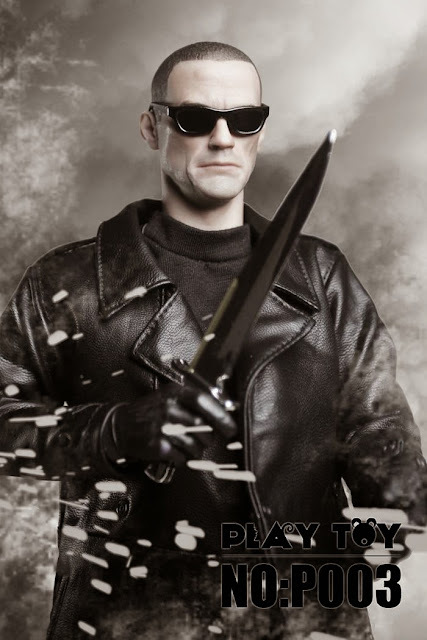 JCVD plays the bad guy (antagonist) and as the leader of a criminal organization, arms dealer and mercenary group “The Sangs”, he has to face off with Barney Ross (Sylvester Stallone) and his team of mercenaries (do-gooders called “The Expendables”). 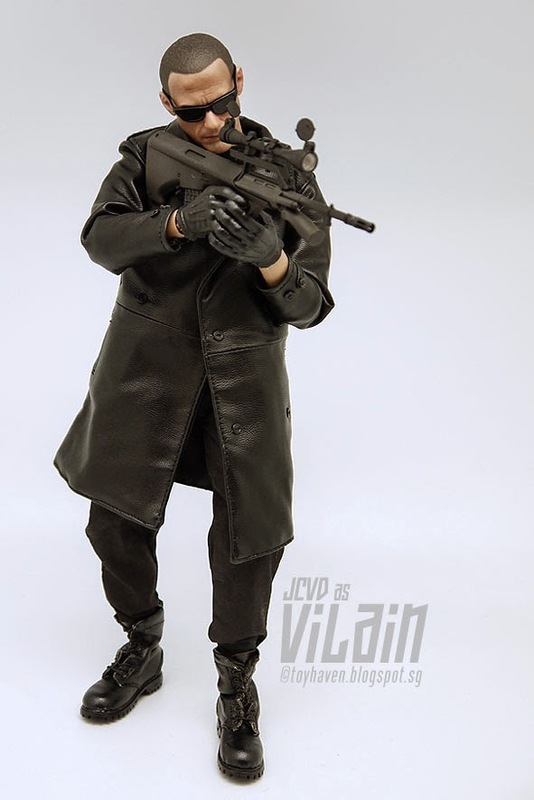 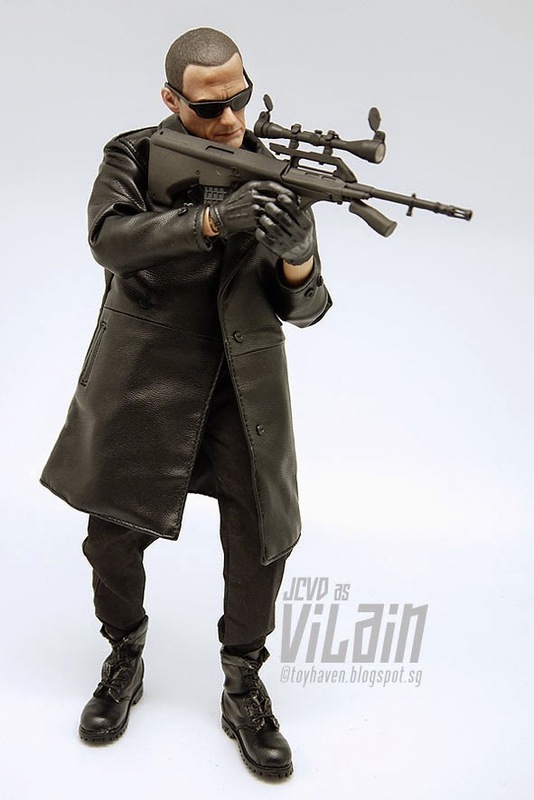 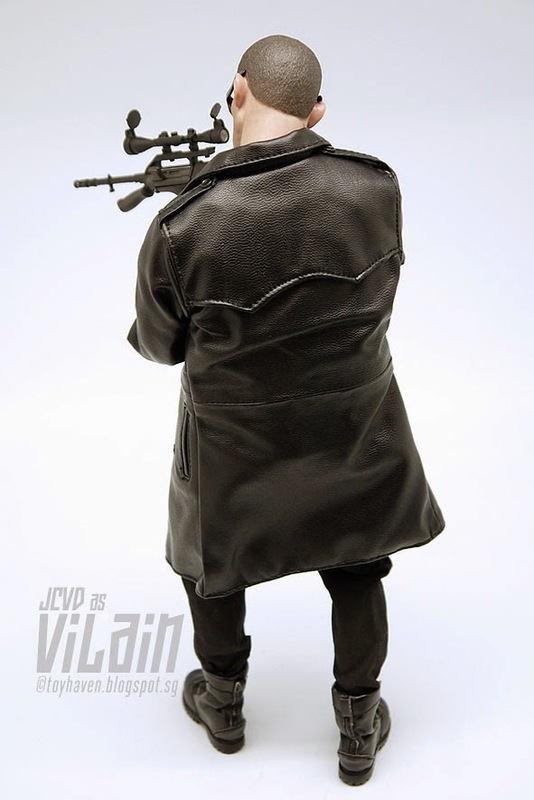 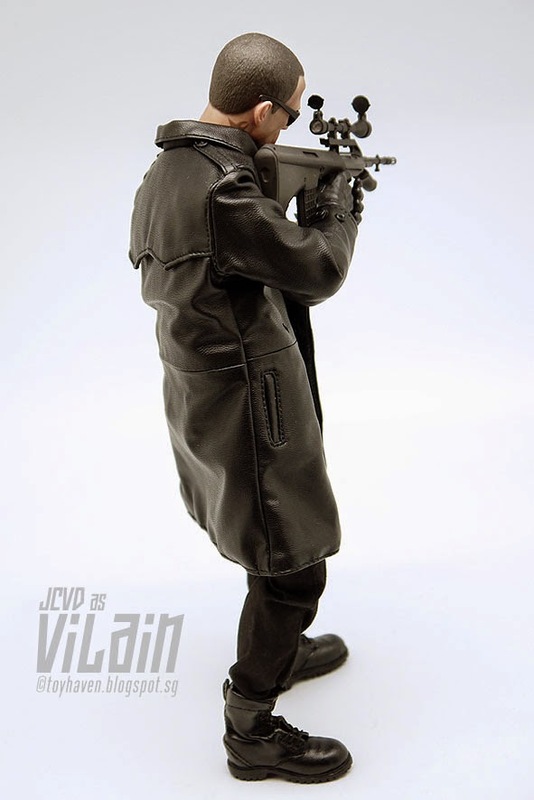 Here’s Play Toy P003 1/6th scale The Villain 12-inch figure OR Jean-Claude Van Damme (JCVD) as Jean Vilain in The Expendables 2 with his black leather coat and Steyr AUG A3 rifle. 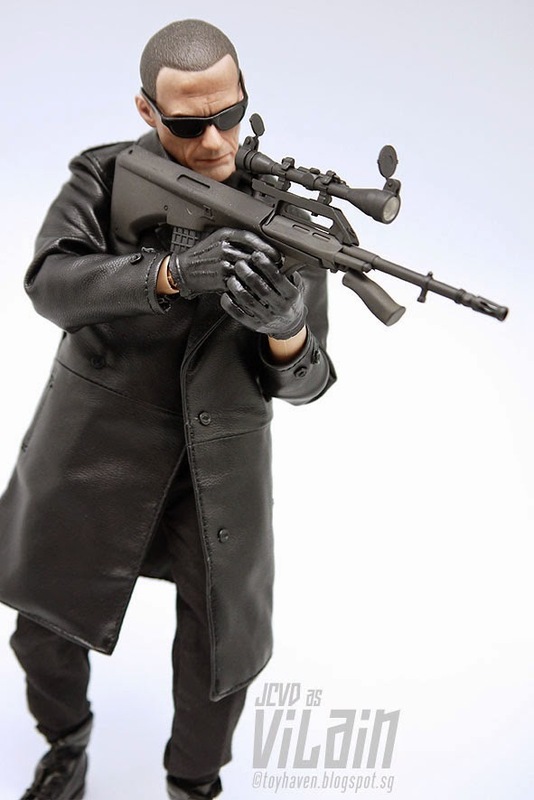 The 1/6 scale Steyr AUG A3 rifle does not have the red dot sight added. 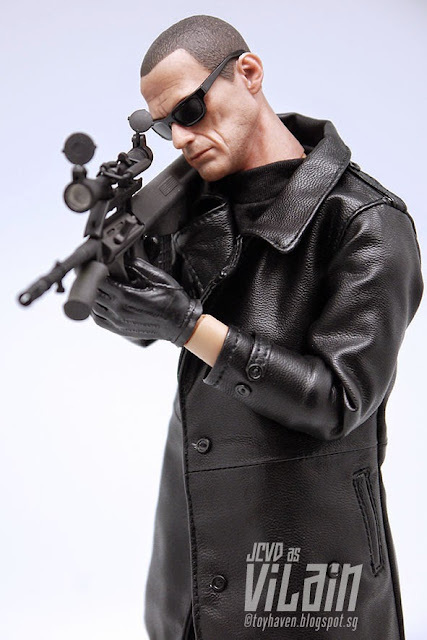 In its place is a sniper’s scope and carrying handle. 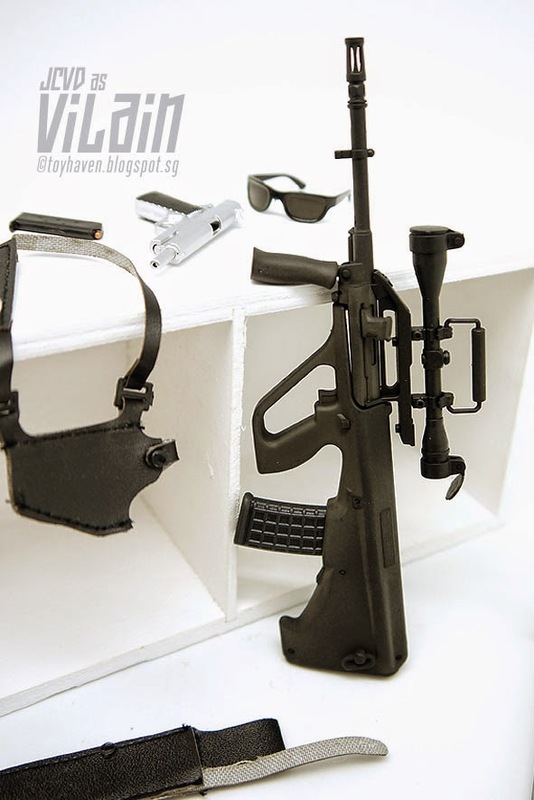 The Steyr AUG is an Austrian bullpup 5.56mm assault rifle, designed in the 1960s by Steyr Mannlicher GmbH & Co KG (formerly Steyr-Daimler-Puch). The AUG (Armee-Universal-Gewehr—”universal army rifle”) was adopted by the Austrian Army as the StG 77 (Sturmgewehr 77) in 1978, where it replaced the 7.62mm StG 58 automatic rifle (a licence-built FN FAL). 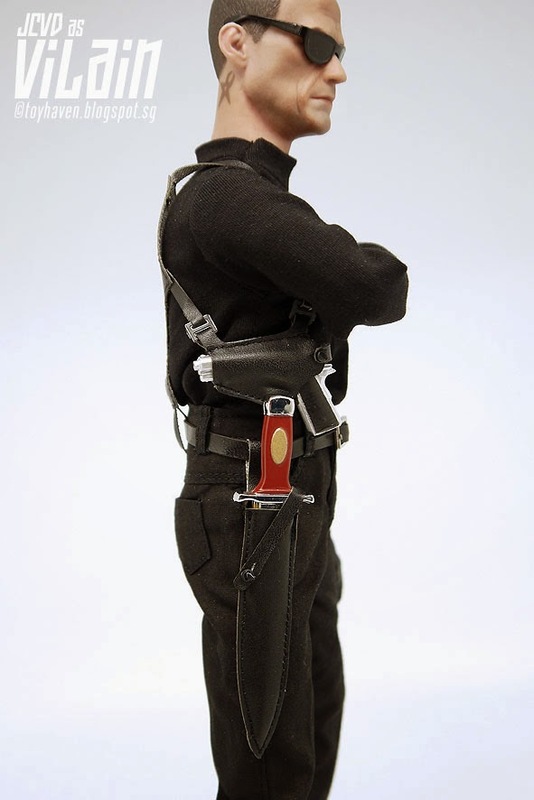 In production since 1978, it is the standard small arm of the Austrian Bundesheer and various national police units. The rifle and its variants have also been adopted by the armed forces of Argentina, Australia, Bolivia, Ecuador, Ireland, Luxembourg, Malaysia, New Zealand, Saudi Arabia, Tunisia, Pakistan, and the U.S. Immigration and Customs Enforcement agency. 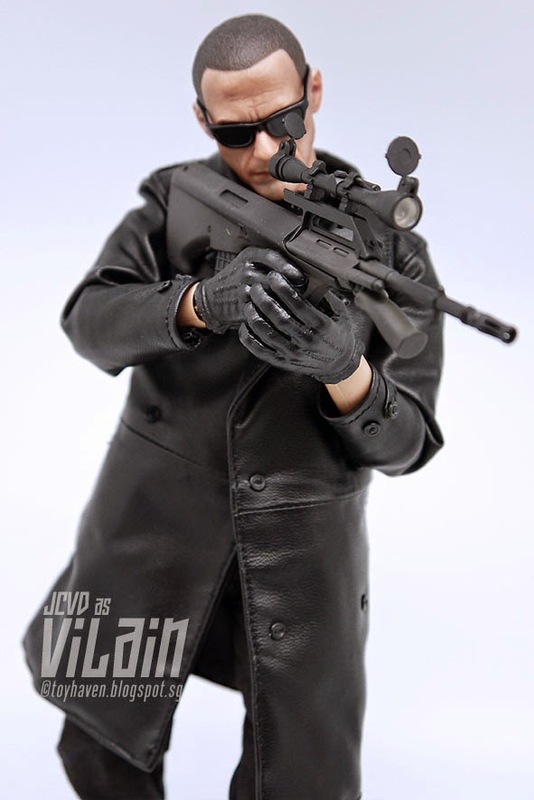 Already covered in my previous review posts HERE (box packaging and contents) and HERE (figure wearing long black coat and armed with his 1/6 scale Colt M1911 pistol), this Play Toy P003 12-inch The Villain figure comes dressed in black leather coat, long sleeve black T-shirt, belt, boots, sunglasses. 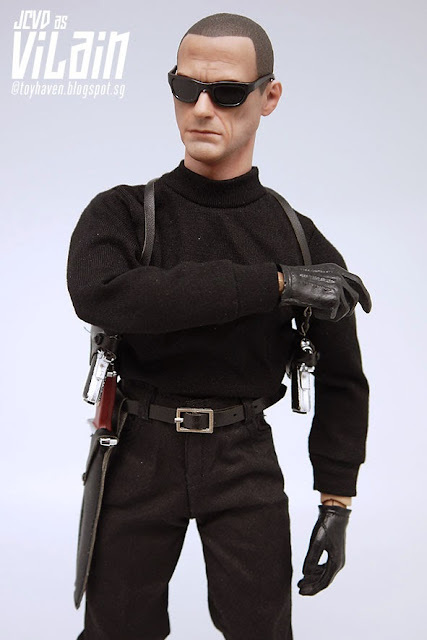 As I mentioned before, I’ve observed over time that the one outfit that doesn’t become outdated is black outfits. As long as 12-inch figures are wearing 1/6 scale black outfits, they will always fit in with any other figure. 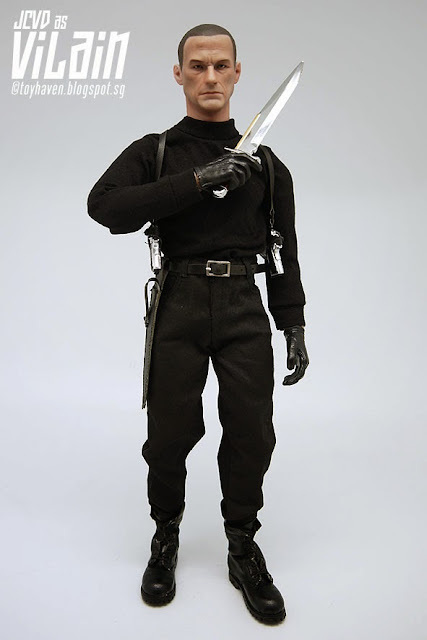 When 12-inch figures were first released back in the 1960s, G.I. 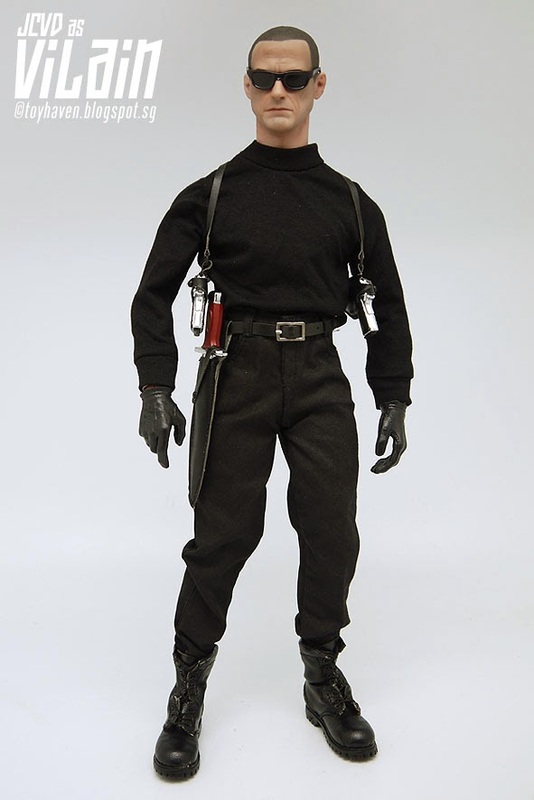 Joe wore Olive Drab basic green uniforms when they went into “battle”. Later on, they would be outfitted in camouflaged uniforms of the day / period, from the Woodlands Camouflage for the jungle to Desert Camouflage (two versions were released: six-color Desert Battle Dress Uniform or DBDU, nicknamed the “chocolate chip” pattern and tri-color Desert Camouflage Uniform or DCU). 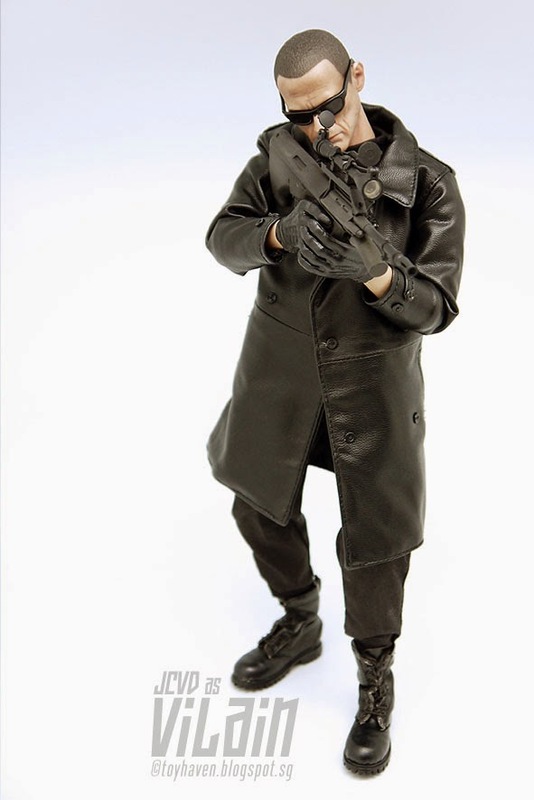 Then there was Multi-Cam and the various digital camouflage patterns, rendering the older patterns obsolete and outdated. 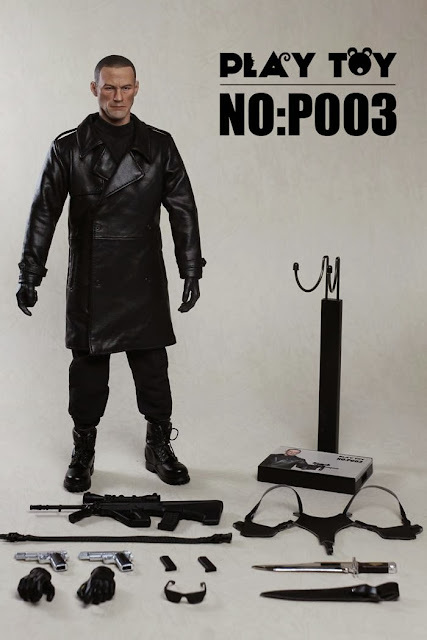 But black is always IN and ever current. 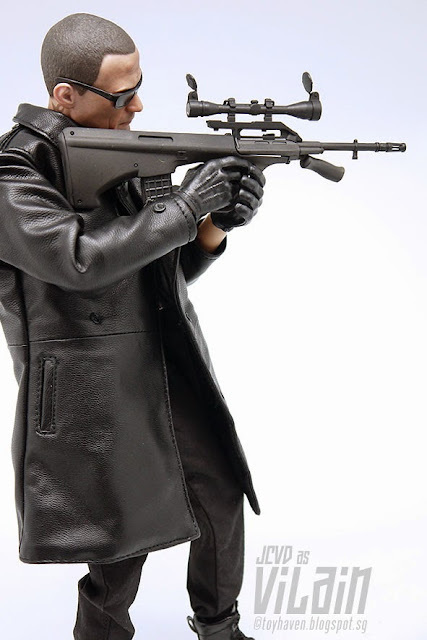 This Steyr AUG rifle being fitted with a sniper’s scope brings to mind another two one-of-a-kind 1/6 scale sniper rifles I’ve come across in collecting 12-inch figures: one is the CSM Sniper Rifle with Zoom Scope that came with the Sideshow Collectibles “X Files” Cigarette Smoking Man a.k.a. 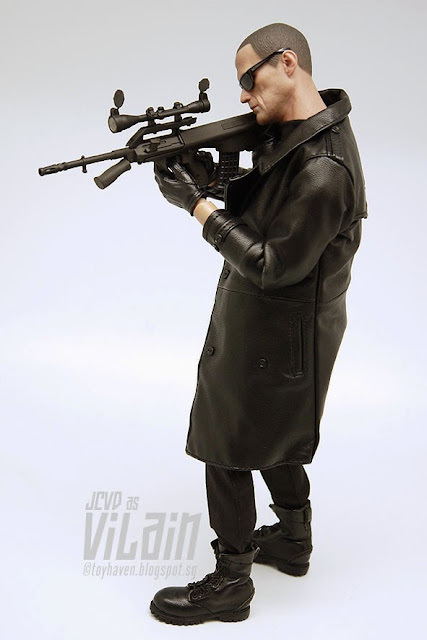 C.G.B. Spender. 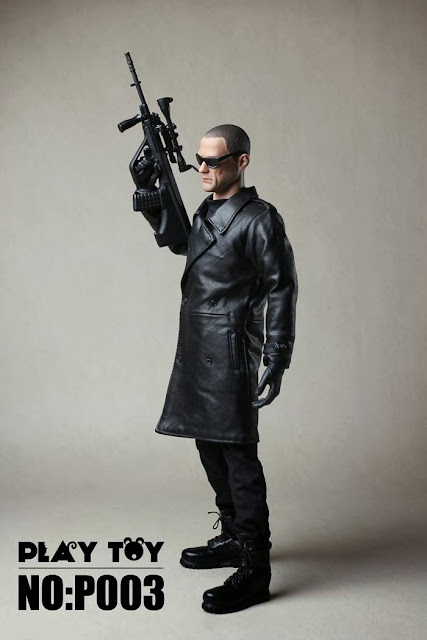 The figure was reviewed HERE and pictures of the weapon are posted HERE. 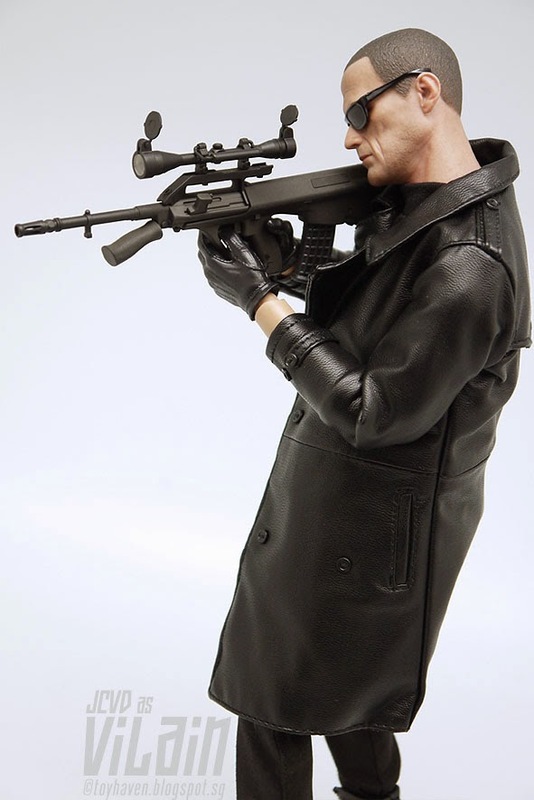 The other unique sniper rifle AR-7 sniper rifle that came with the Blue Box International (BBI) “Elite Force: Terminate” Sniper Assassin Lucifer 12-inch figure. 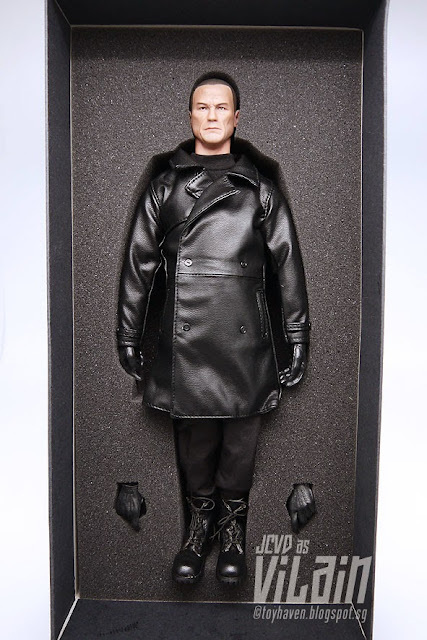 You can check out the pictures HERE with updated pictures of Lucifer HERE. In the 2012 American ensemble action film “The Expendables 2”, Jean-Claude Van Damme portrays Jean Vilain, the leader of an opposing team of mercenaries known as the Sangs. In the beginning of the film, the Expendables are ambushed by international criminal and arms dealer Jean Vilain (Jean-Claude Van Damme), his right-hand man Hector (Scott Adkins) and his mercenary group (the Sangs), and are forced to watch Vilain kill their comrade, sniper Billy the Kid (Liam Hemsworth), the team’s newest recruit and Ross’ protégé. 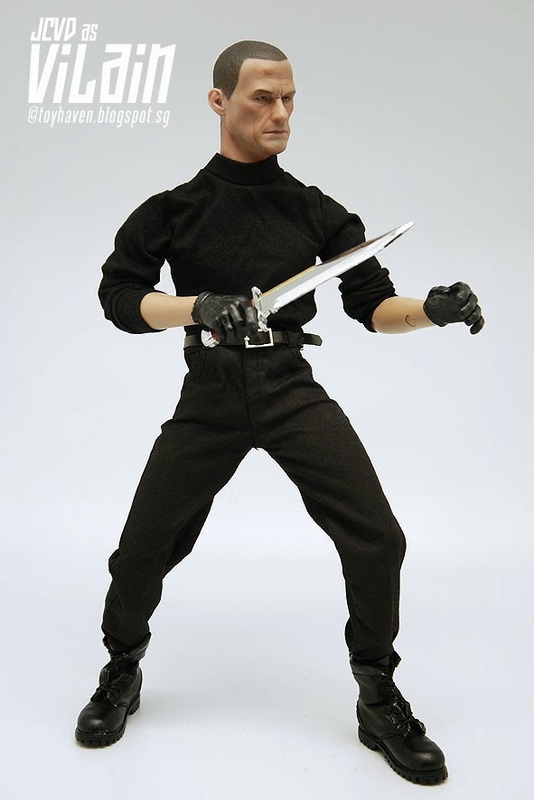 Leader Barney Ross (Sylvester Stallone) and his team of merry men vow to seek vengeance on Vilain. 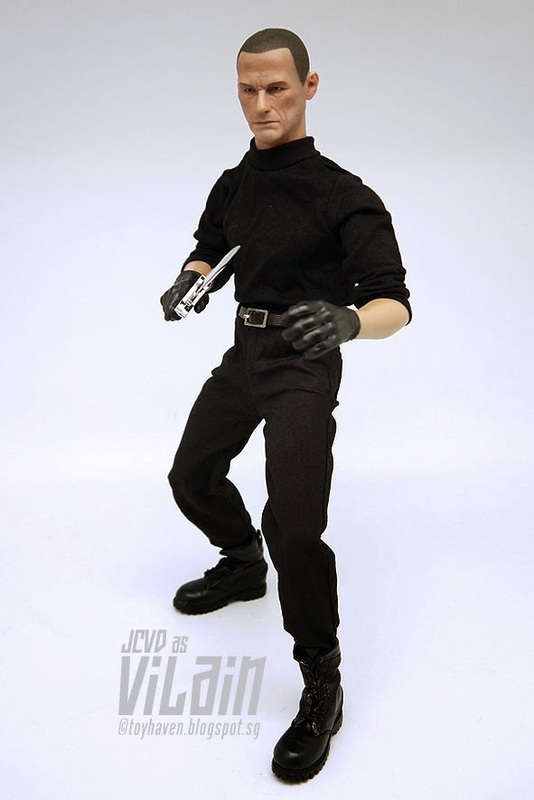 Van Damme was intentionally distant from the cast and crew during filming to stay in character. 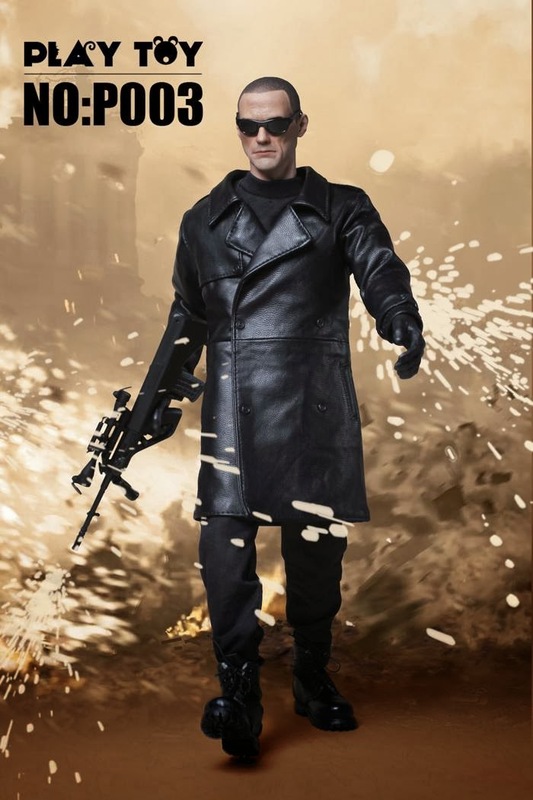 Commenting on the role, Stallone said: “We’ll have a big showdown between me and Van Damme, which has been anticipated for a long time, so it should be a good one.” Van Damme was offered a role in The Expendables, but ultimately turned it down. 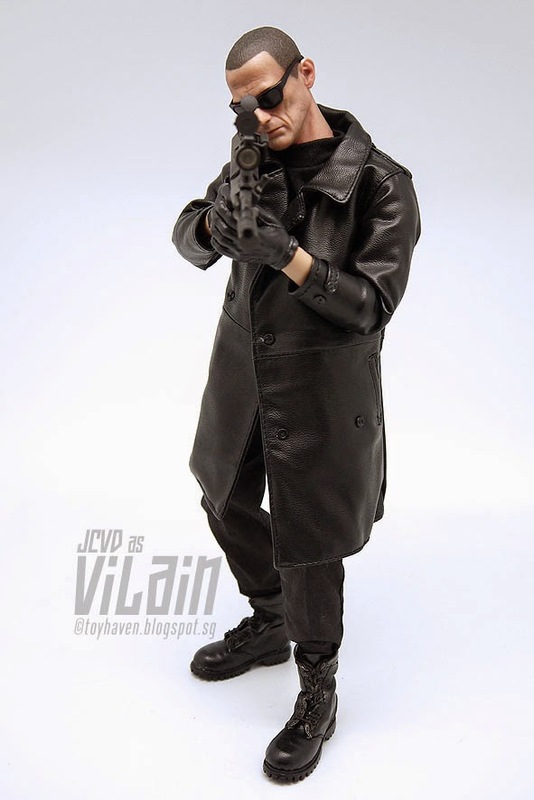 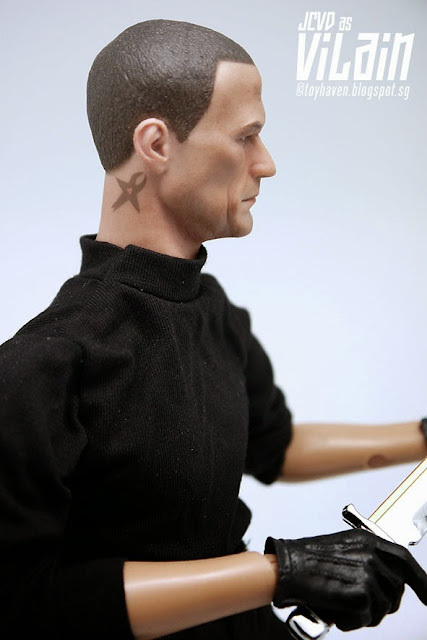 This is the recently released Play Toy P003 1/6th scale The Villain 12-inch figure OR Jean-Claude Van Damme JCVD as Jean Vilain in The Expendables 2 which comes with 1/6 scale head sculpt, 12-inch figure body, 4 swappable hands, black leather coat, long sleeve black T-shirt, belt, tactical belt, boots, sunglasses, AUG assault rifle, pistol x 2, pistol magazines x 2, shoulder holster, metal hunting knife, hunting knife sheath, figure stand. 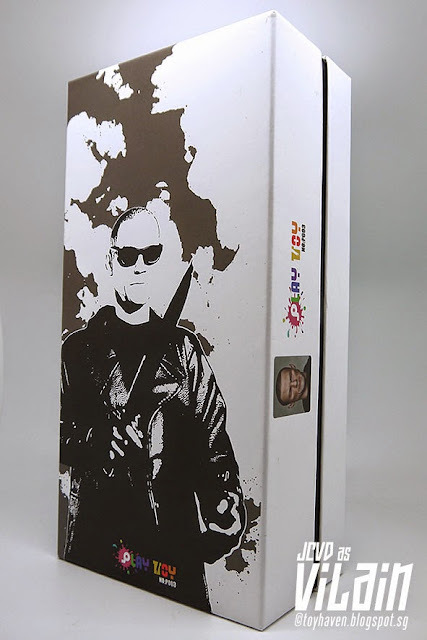 Packaging is simple enough. 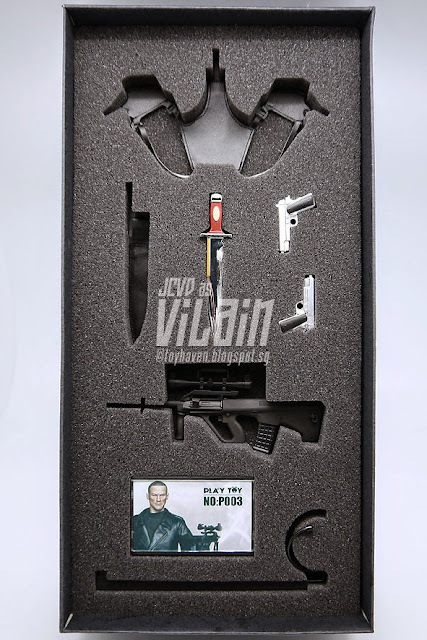 Remove the lid and the 1/6 scale accessories are displayed in the top tray. 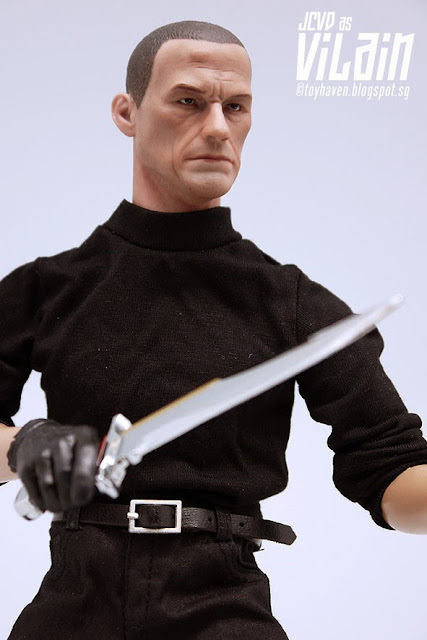 The 12-inch Jean Vilain figure lies in the bottom tray wearing black leather coat, long sleeve black T-shirt, belt, boots. 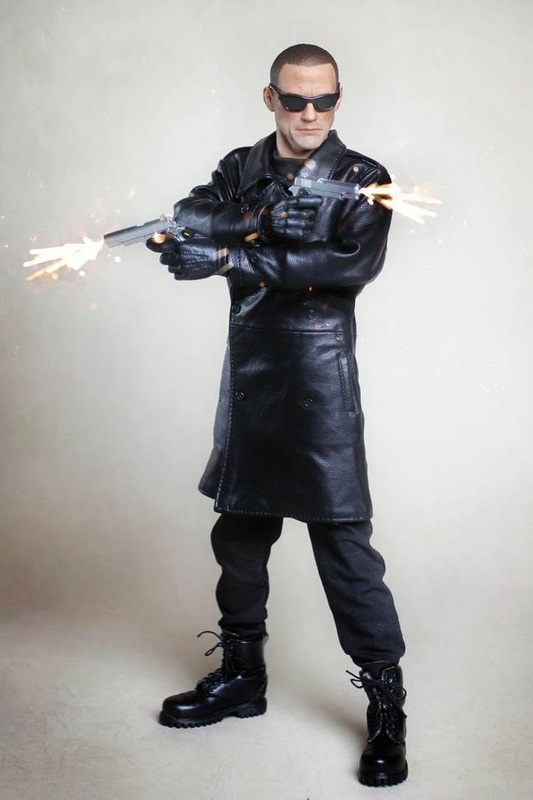 In the film, Jean Vilain (Jean-Claude Van Damme), leader of an Albanian criminal group known as the Sang, uses a Walther P99 with a gold-plated slide as his sidearm. 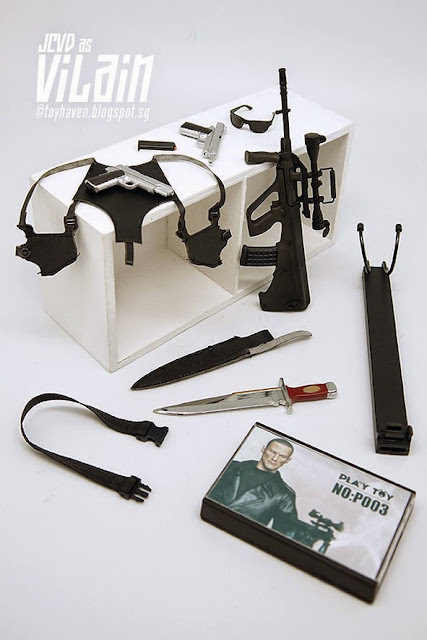 But that’s not what is included with this set. 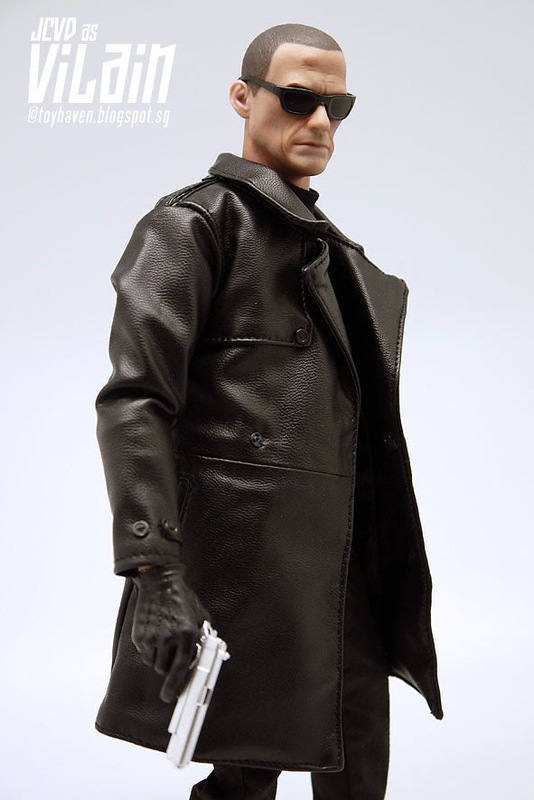 The pistols included appear to be Colt M1911A1 pistols. 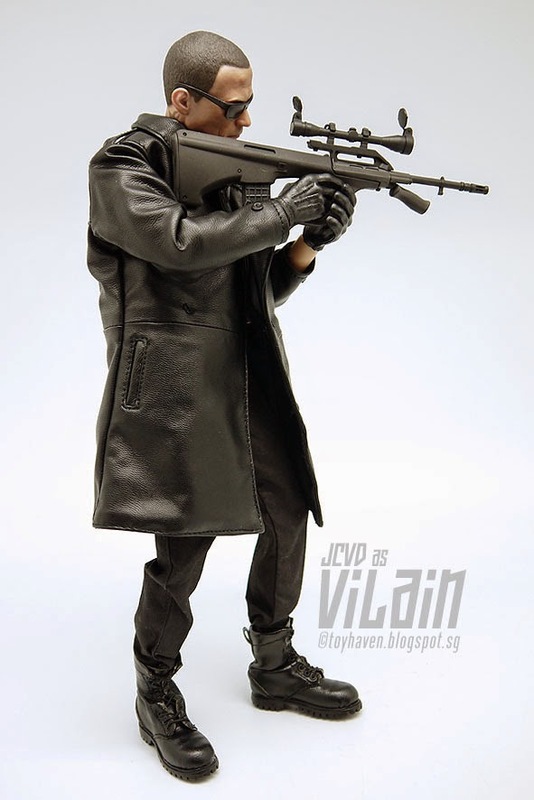 Jean Vilain (Jean-Claude Van Damme) carries a Steyr AUG A3 with an Aimpoint Micro T-1 red dot sight as his primary firearm in the film. This looks to be a 1/6 scale version of the Steyr AUG A3 rifle but no red dot sight is added. 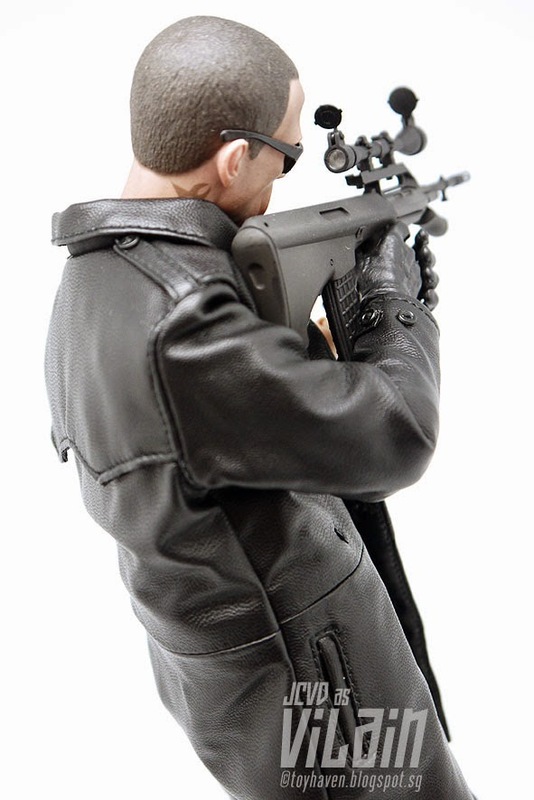 In its place is a sniper’s scope and carrying handle. 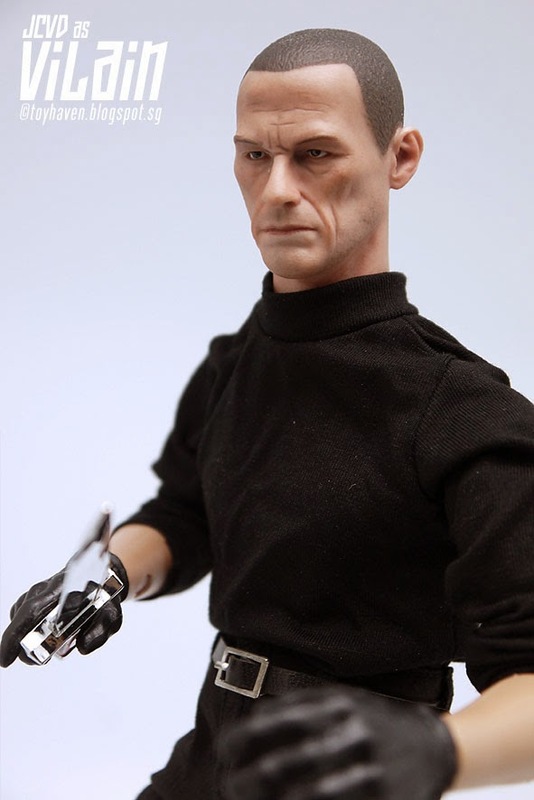 Here are some close-up shots of Play Toy P003 The Villain 1/6 scale head sculpt. 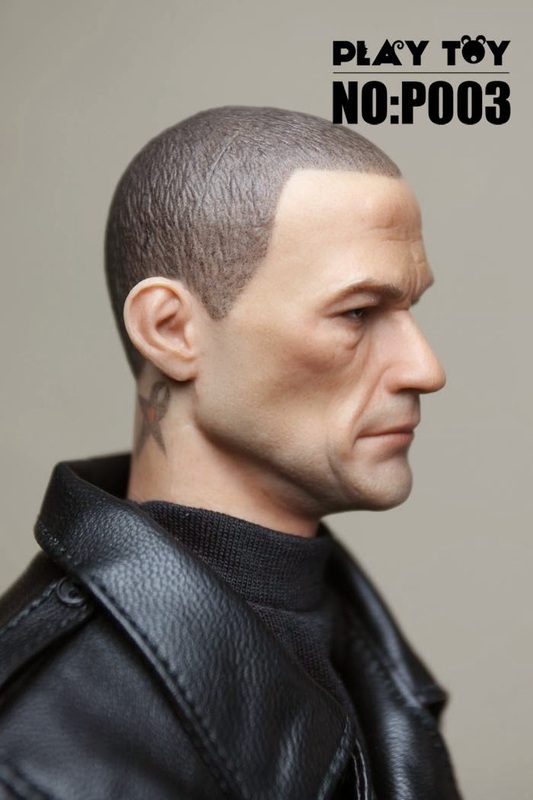 12-inch Jean-Claude Van Damme as Jean Vilain even has the Sangs tattoo on his neck. 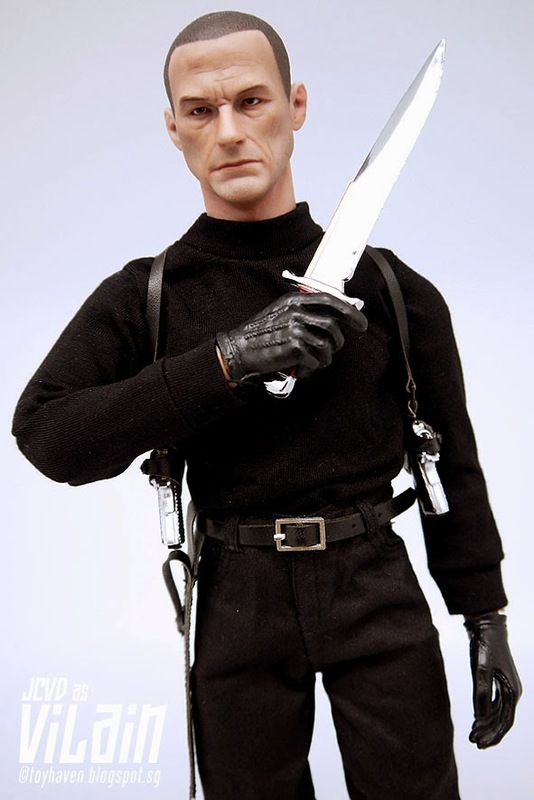 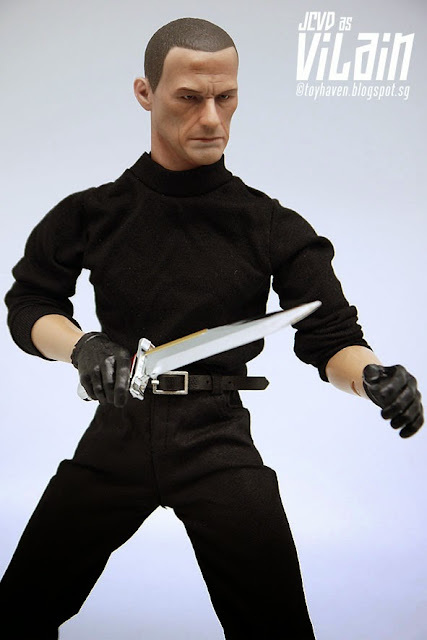 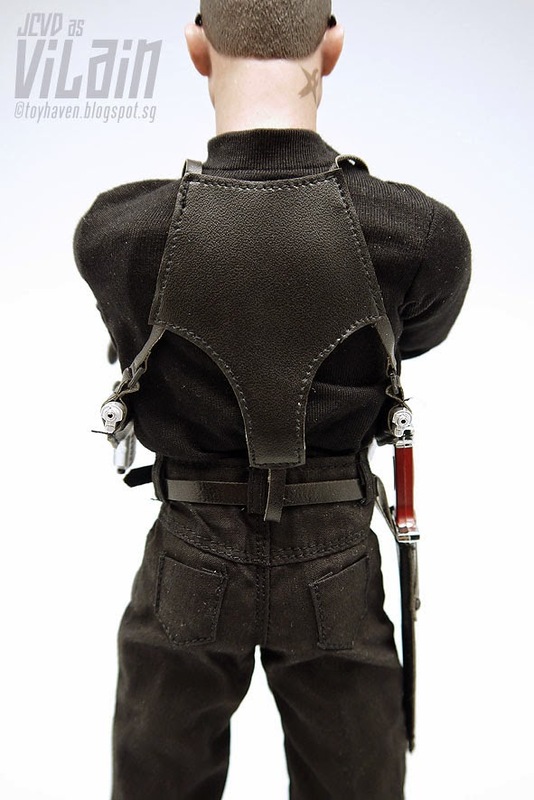 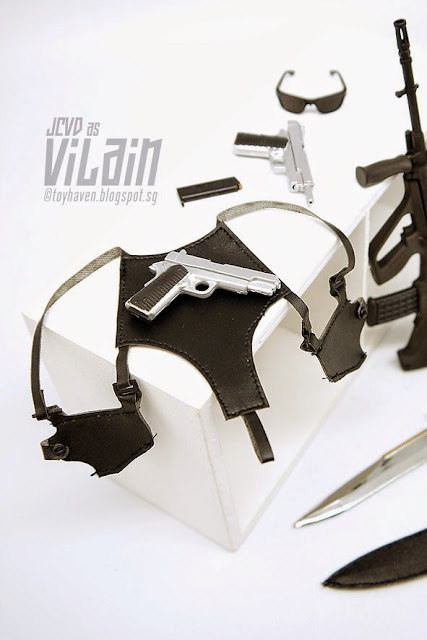 Here’s Play Toy P003 1/6 scale The Villain 12-inch action figure (Jean-Claude Van Damme as Jean Vilain) with his shoulder holsters for his pistols and sheath for his knife. 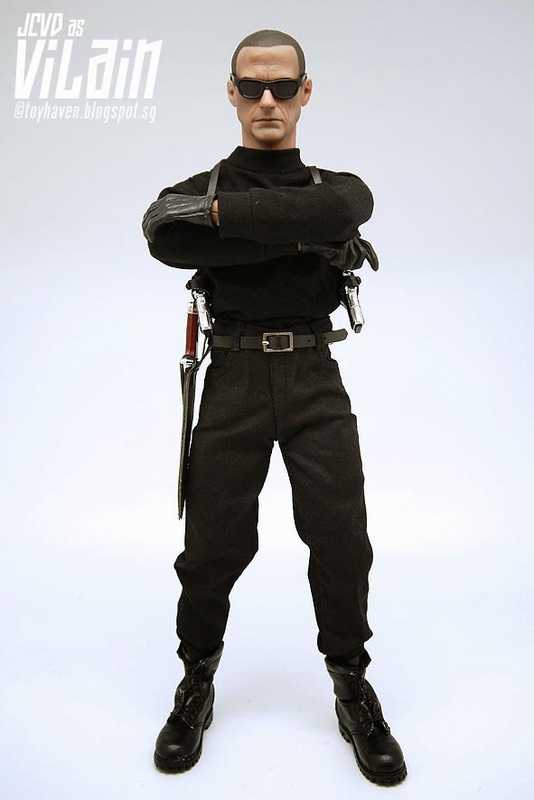 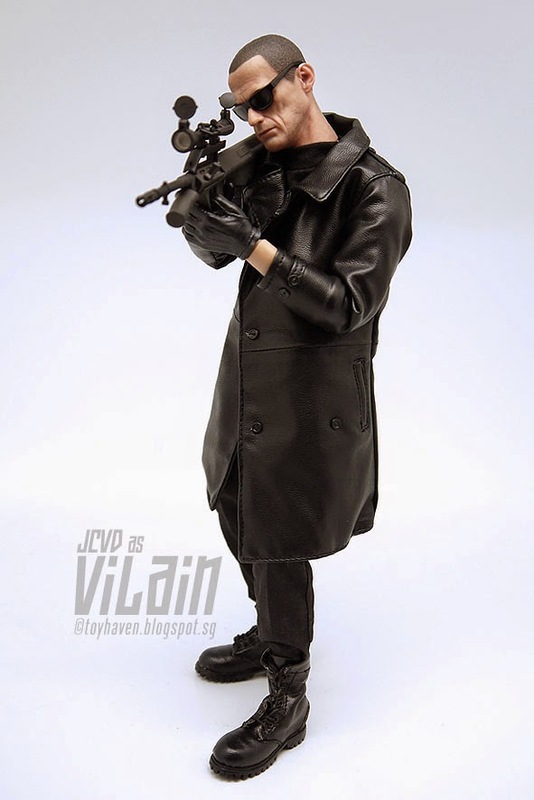 I think the 1/6 scale sunglasses gives the 12-inch Play Toy “Villain” figure a better likeness and resemblance to JCVD. 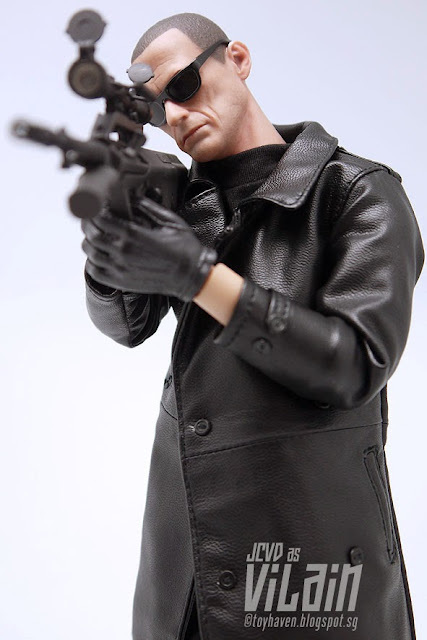 Check out the rest of the pictures below. 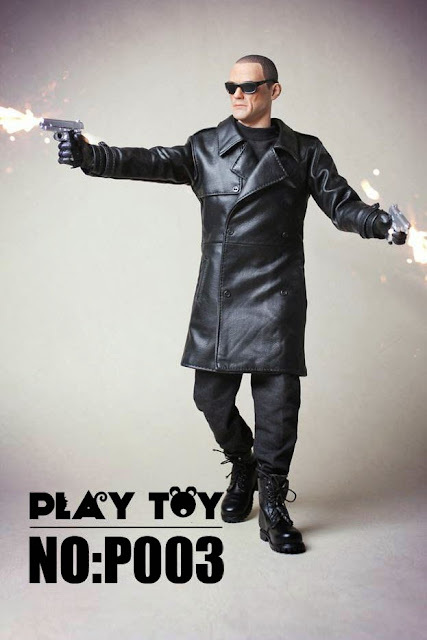 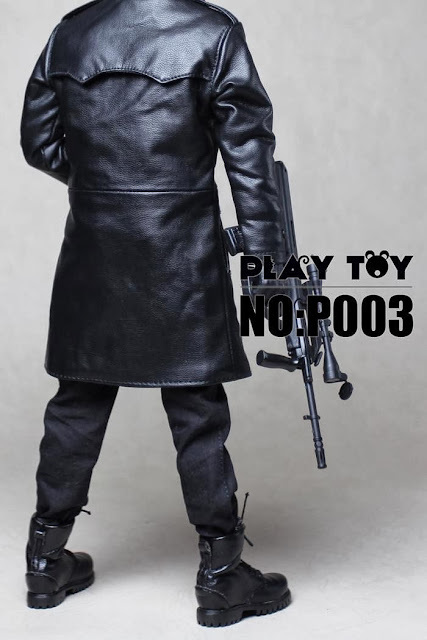 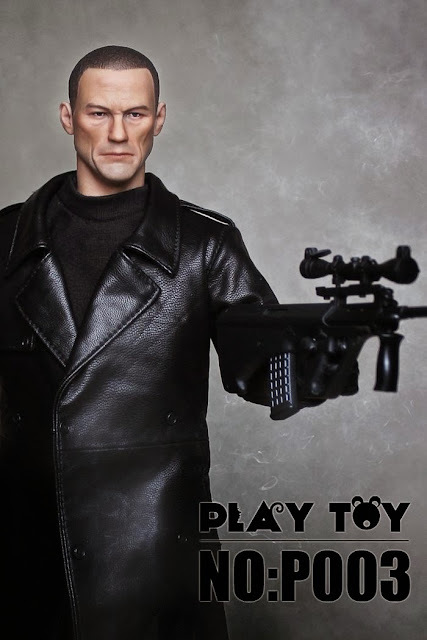 NEXT: Play Toy P003 1/6th scale The Villain 12-inch figure OR Jean-Claude Van Damme JCVD as Jean Vilain in The Expendables 2 with his black leather coat and weapons. 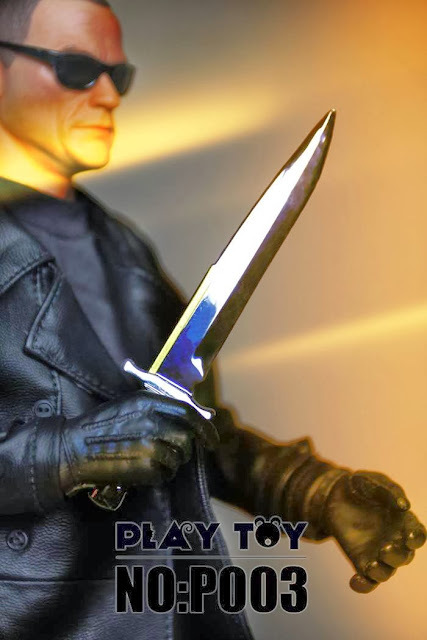 Sideshow Collectibles has released a teaser image (along with a chance to win) its upcoming Jean Grey Premium Format figure. 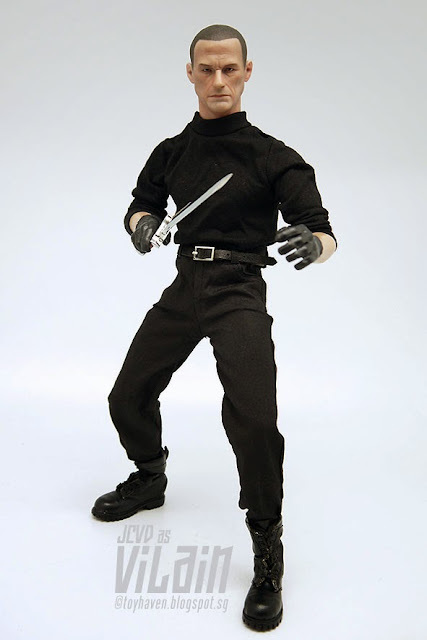 The statue depicts mutant in her Jim Lee-styled ’90s X-Men costume and will be available for pre-order on April 17th. I’m honestly not sure what to make of the statue so far, especially given the presumably photoshopped psychic effect. 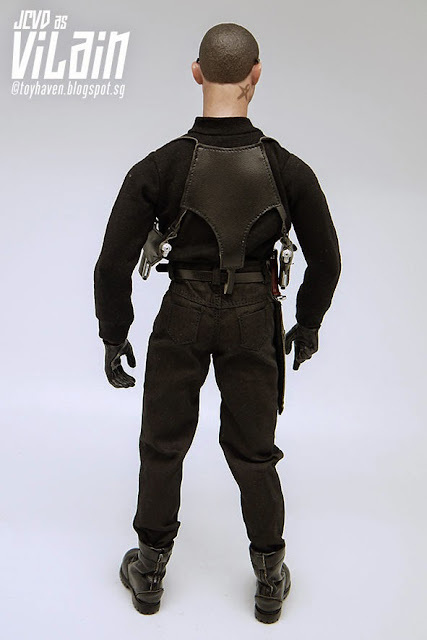 As such, I’ll probably have to reserve judgment until Sideshow releases a full photo gallery although, given that it’s Jean Grey, I’m hoping for the best. 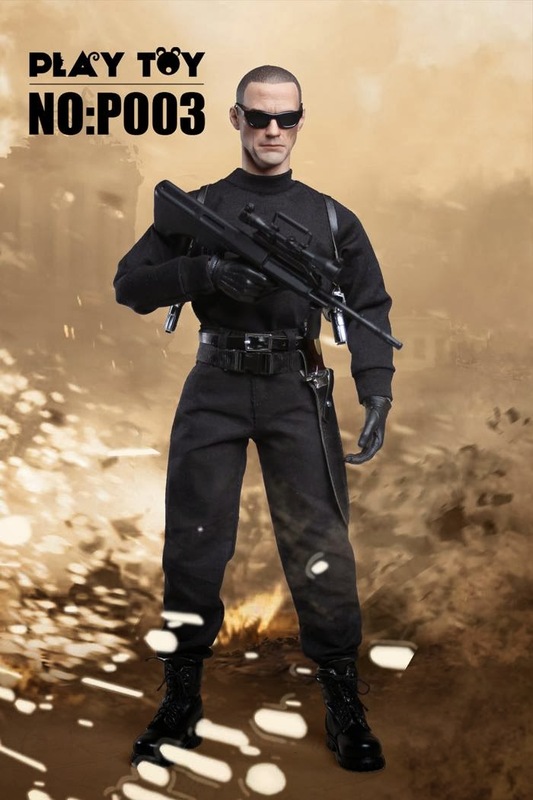 The Expendables 2 is a 2012 American ensemble action film directed by Simon West, written by Richard Wenk and Sylvester Stallone and based on a story by Ken Kaufman, David Agosto and Wenk. It is a sequel to the 2010 action film The Expendables, and stars Sylvester Stallone, Jason Statham, Jet Li, Dolph Lundgren, Chuck Norris, Terry Crews, Randy Couture, Liam Hemsworth, Jean-Claude Van Damme, Bruce Willis and Arnold Schwarzenegger. 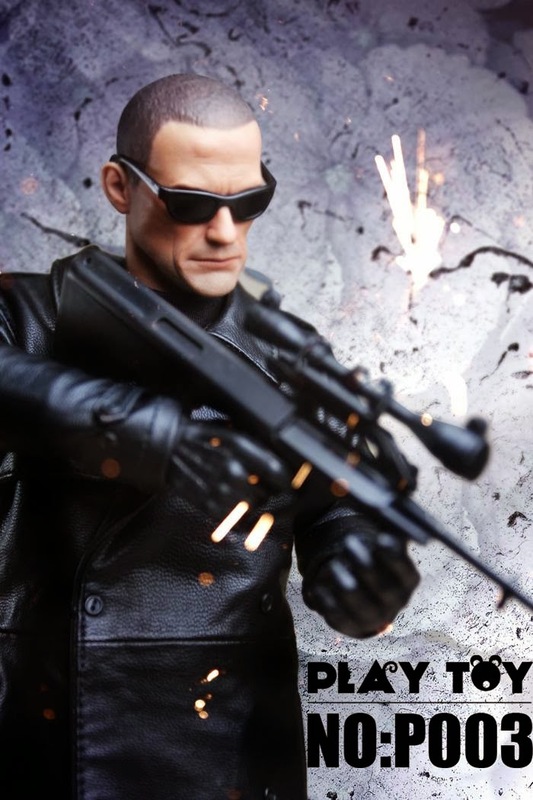 The story follows the mercenary group known as “The Expendables” as they undertake a seemingly simple mission which evolves into a quest for revenge against rival mercenary Jean Vilain, who murdered one of their own and threatens the world with a deadly weapon. Jean-Claude Van Damme plays Jean Vilain: Leader of an opposing team of mercenaries known as the Sangs. 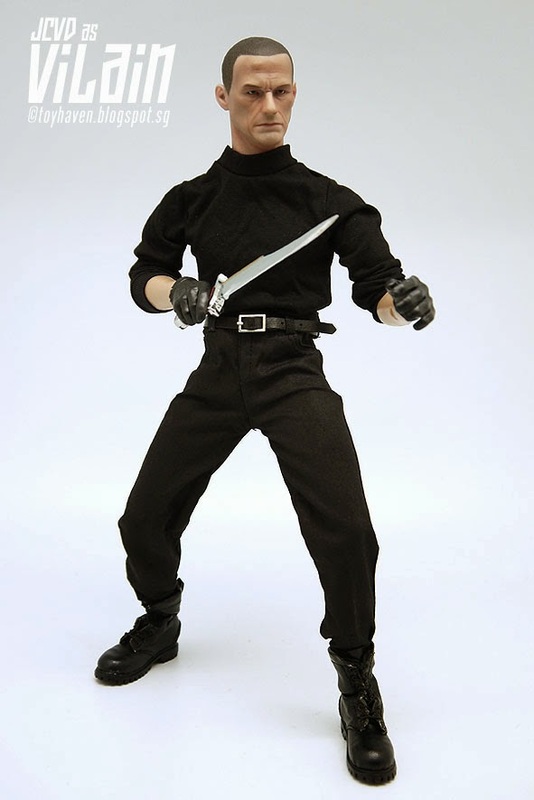 Van Damme was intentionally distant from the cast and crew during filming to stay in character. Incoming Play Toy P003 1/6th scale The Villain 12-inch figure OR Jean-Claude Van Damme JCVD as Jean Vilain will come with 1/6 scale head sculpt, 12-inch figure body, 4 swappable hands, black leather coat, long sleeve black T-shirt, belt, tactical belt, boots, sunglasses, AUG assault rifle, pistol x 2, pistol magazines x 2, shoulder holster, metal hunting knife, hunting knife sheath, figure stand. Scroll down to see the rest of the pictures. 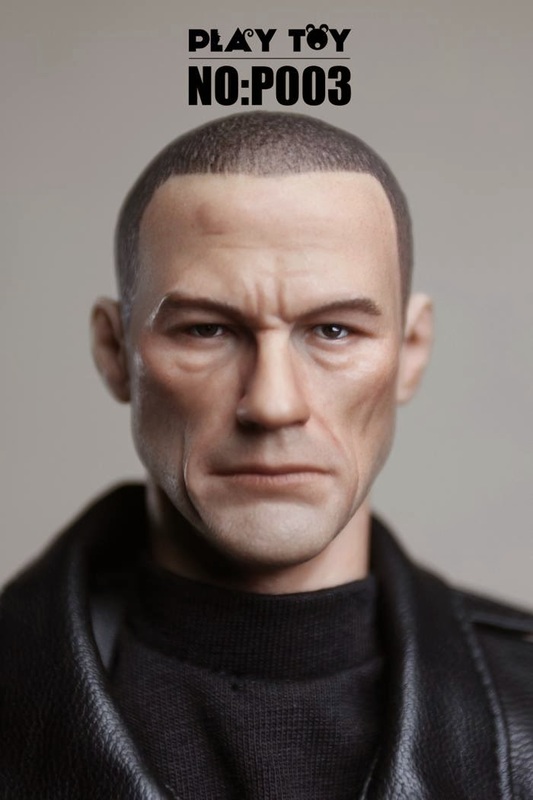 Does the 1/6 scale head sculpt resemble Jean-Claude Van Damme?